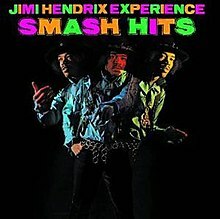 "Smash Hits" is a compilation of singles by the Jimi Hendrix Experience, and the very first compilation album for Jimi Hendrix, released in mono in the United Kingdom in 1968 on Track Records 612004, and a year later in stereo in the United States on Reprise Records, catalogue 2276. It peaked at number four on the British album chart and number six on the Billboard 200, and has been certified double platinum by the RIAA. The 'rest of the world outside of US/Canada' (and in this unique case Barclay France who released their own choice of 'Greatest Hits') version appeared only four months after the second studio album, "Axis: Bold as Love", while the band worked on their third. It contained their first four UK hit singles, "Hey Joe", "Purple Haze", "The Wind Cries Mary", and "Burning of the Midnight Lamp", along with respective B-sides, supplemented by four tracks taken from the debut LP "Are You Experienced": "Fire", "Can You See Me", "Manic Depression", and "Foxy Lady". It marked the first appearance on album of "Burning of the Midnight Lamp", five months ahead of its placement on "Electric Ladyland". In the US, however, Reprise Records felt that a greatest-hits collection would have been premature in 1968, as up to then Hendrix had only had three low-charting singles in the US: "Purple Haze" peaked on the Billboard Hot 100 at #65, with "Foxy Lady" at #67 and a track taken from Axis, "Up from the Skies," at #82. Hendrix gained two more chart entries in 1968, both being tracks from Electric Ladyland: "Crosstown Traffic" going to #52 and "All Along the Watchtower," his only US Top 40 'hit', at #20. A stereo version of "Fire" issued as a single in April 1969 missed the chart. As no new studio album was on the horizon in 1969, partly owing to the disbanding of the Experience by Hendrix exacerbated by tensions with Noel Redding, the label decided to issue a different compilation with the same title. To include three British hit singles on the American configuration of the debut album, there were also the tracks that had been elbowed off the UK Experienced which had yet to be released on album in the States, or in stereo. All songs by Jimi Hendrix, except where noted. The stereo take of "Red House" derives from a different session than the original mono take found on the UK version of Are You Experienced. Album produced by Chas Chandler.